I have an admission, my sports bra is the colour of an unbleached tea bag! Was it ever white? But it’s seen me through a few adventures and has plenty more ahead. I placed it in the washing basket tonight, wondering if it would allow me to do anything energetic this week by washing and drying (and staying in one piece!) in time. You see, I am a woman who feels the need for movement, for sweating and for that healthy glow. My sports bra lets me do this, I couldn’t manage without it! My sports bra came with me to Zumba tonight and was dutifully rewarded by being dumped into the washing basket. As usual I had a great time at Zumba. If you haven’t tried it, do! Pumping latino beats with a great injection of western dance music. It’s about rhythm and dance as much as fitness but you do more than you think. My class is taken by Cathy Q and what a corker she is! She exudes energy and really gets the class going. She inspires me to feel strong and confident not only because she is ace but because she does so much for Breast Cancer. My bra and I have her to thank for reducing my risks, for reminding me to check my breasts regularly and also in raising money for various breast cancer charities. Studies have shown that by doing exercise I am helping to reduce the risk of getting breast cancer. My bra and I try at least three times a week to get some exercise. After all the huffing and puffing I do, I try to eat healthily as grabbing a bag of crisps after the gym wouldn’t make sense. Health diet can also reduce my risk of contracting the disease. I also have to shower after exercise ( it would be rude not too) and this gives me ample time to give my breasts an examination. I hope this would help me find any lumps, changes in shape or colour and size early. So, my dear grey sports bra and Cathy Q fitness are doing a great deal for me and the fight against breast cancer. 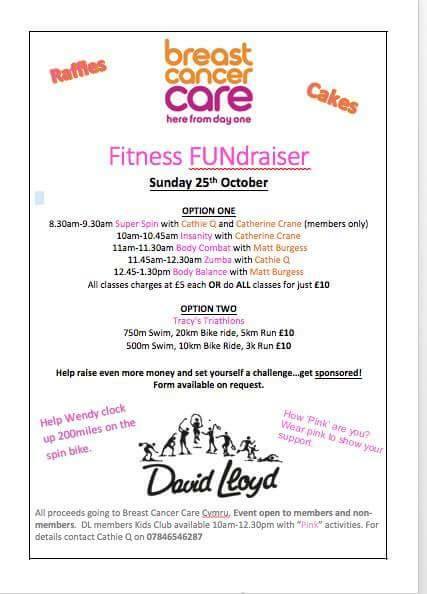 You can find out more details of upcoming fundraisers for Breast Cancer Awareness months on Cathys Facebook page Cathy Q Fitness Group or find her at Marlborough Road Primary School Every Tuesday and Thursday at 7pm.